if they can knock the breath out of you with out kick, they should gang up with ostriches. Together they could be an awesome gut-kicking duo!!!!! Isn't Toulouse the name of one of the cats in the movie Aristocats? no! Do not talk about my friends like that! I declare peace between people and kangaroos! 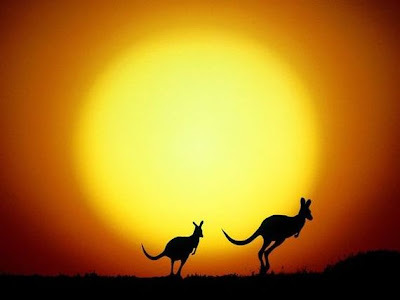 kangaroos are going to take over the world. They're hilarious when they sit on their tails, which is probably why they attack us. What?! How can you just free kangaroos like that? They are dangerous! I'm from Australia, and even though I haven't seen many kangaroos, I know they are dangerous. They are fast, scary and deadly. They can PUNCH people! (And kick, like Ananka said). When we went up the mountains to the snow with lots of family and friends, none of us wanted to sleep on the bed that had a small window riiiiight up the top of the wall - we thought a kangaroo might jump in through that tiny window! Yes, it's true that Kangaroos can be, er, vicious, but they are very friendly too. I've even hugged and fed some too! It's just the male ones which are agrressive, I think. I think I might have been to that theme park when I was little, but it never said the name of the park! Anyway, if they were kangaroos from a theme park, you'd think they would have trained them to not be hostile, just in case something like this happens. Wasn't there some lame movie in the early 2000s that was about a gangster kangaroo that stole a lot of money? And conceivably, if the Kiki Strike books (especially the second one) are printed in France, someone could've thought that freeing captive animals was an awesome idea and decided to copy it in real life. Just a thought. Liltomboyblue: Yeah, I think you're thinking of Kangaroo Jack. They made a weird cartoon "sequal" (the original was live-action, by the way) to it, too. the news article didnt say, but i'm pretty sure the theme park was called Walibi, i've never been but lots of my friends go..thats so sad about the ones that got killed a while back!! what an awful thing to happen. Dante's inferno: Yeah, that's right... it looked really weird. I live in Australia in the outback with kangaroos hopping up to my front door step, and they are the friendliest. I have photos of me when I was little feeding these animals by hand. The males on the other hand can sometimes be dangerous, ONLY if you are crule or are trying to take their mate that they can be a little scary. Many are killed each year for their claws and are hit by a car. Its sad to see them lying on the side of the road dead. People should feel more concerned about our wild life. Know your boundaries and respect their land. Humans took it from them, So we should respect it and live together peacefully. Same said about our crocs. DON'T swim in water you know is the home of a croc. And if there is flooding. JUST STAY OUT OF THE WATER!